"Your search for hard-to-find good potato pancakes is now over. These are good old homemade ones that are slightly sweet, and very very moist." In a medium bowl, mix together flour, salt, and baking powder. Stir in mashed potatoes and onion until thoroughly combined. In a separate bowl, whisk together eggs and milk, and stir lightly into potato mixture. Stir in corn syrup and nutmeg, mixing well. Heat a large griddle to medium-high heat. Coat with shortening and spoon potato mixture onto griddle in 12 equal portions. Fry until brown on both sides. Serve hot. 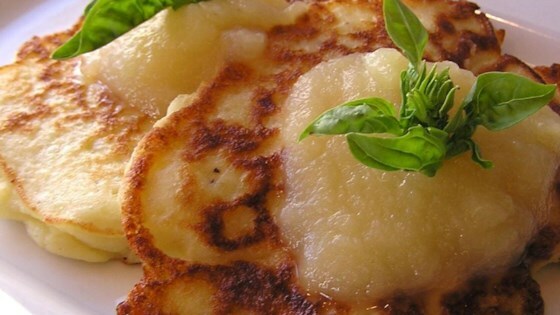 My family absoultely hated these potato cakes, they didn't look bad but they just tasted awful!!! This was a big disappointment. The pancakes were extremely doughy and heavy, and didn't have much appeal with the family. But at least we used up the leftover mashed potatoes! Loved these, thought they were a great use for some leftover mashed potatoes I had in the fridge. I used my garlic mashed potatoes and served them with honey butter.